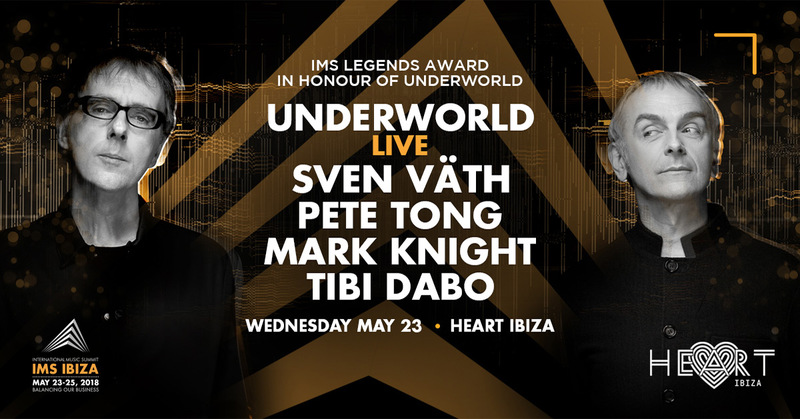 International Music Summit (IMS) recognise and pay tribute to to an electronic music act that has helped write dance music history; Underworld, recipients of the 2018 IMS Legends Award. IMS today announce the full line up for Underworld Live, which takes place after the celebratory dinner event at Heart Ibiza, bringing an intimate version of the duo’s exhilarating and dynamic live experience to the white isle and providing a rare opportunity to get close to one of electronic music’s biggest and most respected bands. Another unmissable artist to join the fully loaded line up is Mark Knight, Toolroom Records label boss and producer who has brought us some of the best-known dance tracks of our time, including ‘Downpipe’ featuring Karl Hyde of Underworld on vocals and which remains one of the top-selling tracks from Toolroom’s extensive catalogue. Completing the line up is Tibi Dabo, the emerging Spanish DJ making waves in the dance scene that has been noticed by many established artists including Sasha who signed his first e.p ‘Ende’.